Bharata Natyam (|Tamil: பரதநாட்டியம்) is a classical Indian dance form that is popular and nurtured in the Indian state of Tamil Nadu. This dance form denotes various 19th-and 20th-century reconstructions of Sadir, the art of temple dancers called Devadasis. Sadir in turn, is derived from ancient dance in the treatise Natya Shastra by Bharata. Its origin traced to more than 3000 years ago, is from South India and is now a National Dance of India. It is performed both men and women but more appealingly and pleasantly by women. It is inferred the name is derived from sage Bharata Muni who scriptedthe Natya Shastra to which Bharata Natyam owes many of its ideas. This etymology also holds up to scrutiny better since Bharathanatyam is considered to be 'short form' (kuril) wherein "Bhavam" means expression and "ragam" meaning medium, "thalam" meaning rythm and natayam meaning dance, consist the 'long form' (nedil). Today, it is one of the most popular and widely performed dance styles and is practiced by male and female dancers all over the world. Dr T. Balasaraswathi quoted in Kali Prasad Goswami (2000). Devadāsī: Dancing Damsel. APH Publishing. p. 45. ISBN 978-81-7648-130-4. ...the traditional order of the Bharata Natyam recital viz., Alarippu, Jatiswaram, Sabdane, Varnam, Padams, Tillana and the Slokas is the correct sequence in the practice of this art, which an artistic Yoga, for revealing the spiritual through the corporeal. Bharta Natyam is a resolutely a global form. It has circulated internationally at least since 1838. In the last two decades, however, this circulation has accelerated; its viewers too are on the move. A dancer can no longer assume that she performs for an audience of afficiandos. In Janet O'Shea (21 May 2007). At Home in the World: Bharata Natyam on the Global Stage. Wesleyan University Press. p. xi. ISBN 978-0-8195-6837-3. Several Telugu composers settled in Tamilnadu for generations produced padams. In Amaresh Datta (1987). Encyclopaedia of Indian Literature: A-Devo. Sahitya Akademi. pp. 449–. ISBN 978-81-260-1803-1. The revival of Bharat Natyam therefore depended not only on politics, but also on the ability of practitioners and promoters to articulate their understanding of the dance form’s history. Rukmini Devi Arundale was an invaluable contributant to the rebirth of Bharata Natyam as an accepted dance form, removing the unpleasant eroticism of dasi attam, and like Queen Santala of the eleventh century, showing that dance is a means of expression for all and is a true form of beauty. From BhAratiya Vidhya Bhavan recordS Quoted IN Hae-kyung Um (21 July 2004). Diasporas and Interculturalism in Asian Performing Arts: Translating Traditions. Routledge. pp. 97–. ISBN 978-0-203-64190-3. ...the fillip given to such ancient traditional forms as the Sadir, Bhagavata Mela, Kuchipudi, Kathakali, and Yakshagana by the revival movements in the country, has not been wholly to their advantage. Often, indeed we find corrupt tendencies and outlandish tastes...insinuating themselves … ostensibly in order to make the art fashionable. By K. Chandrasekharan in History of Bharatanatyam. Rangashree Organization. It becomes a momentous occasion, therefore, when someone emerges showing the restraint and spirituality of approach required to retain the essential quality of an art that took its birth with a sage. By K. Chandrasekharan on Rukmini Devi Arundale quoted in "History of Bharatanatyam". In Alessandra Iyer (1997). South Asian Dance: The British Experience. Taylor & Francis. p. 34. ISBN 978-90-5702-043-8. T Balasaraswati On Bharatanatyam. Carnatica.net. Retrieved on 11 January 2014. In "T Balasaraswati On Bharatanatyam"
In the beginning, Alarippu, which is based on rhythm alone, brings out the special charm of pure dance. The movements of Alarippu relax the dancer’s mind and thereby her mind, loosen and coordinate her limbs and prepare her for the dance. Rhythm has a rare capacity to invoke concentration. Alarippu is most valuable in freeing the dancer from distraction and making her single-minded. The Bharata Natyam recital is structured like a Great Temple. We enter through the Gopuram (outer hall) of alarippu, cross the Ardha mantapam (half-way hall) of Jatiswaram, then the Mantapa (great hall) of Sabdam, and enter the holy precinct of the deity in the Varnam. This is the place, the space that gives the dancer expansive scope to revel in the rhythm, moods and music of the dance. The Varnam is the perpetuity which gives ever-expanding room to the dancer to delight in her self-fulfillment, by providing the fullest scope to her own creativity as well as to the tradition of the art. The Padam follows. In dancing to the Padam one experiences the containment, cool and quiet of entering the sanctum from its external precinct. The expanse and brilliance of the outer corridors disappear in the dark inner sanctum; and the rhythmic virtuosities of the Varnam yield to the soul-stirring music and abhinaya of the Padam. Dancing to the Padam is akin to the juncture when the cascading lights of worship are withdrawn and the drum beats die down to the simple and solemn chanting of scared verses in the closeness of God. The basis for the Bharat Natyam technique is the perception of the human body as a geometric ideal both in its static position (pictured as the straight axis around which a circle could be drawn) and its articulation through the dance (which explores all the harmonious geometric shapes possible from the central axis within the circle. In Alexandra Carter; Janet O'Shea (2010). The Routledge Dance Studies Reader. Taylor & Francis. p. 184. ISBN 978-0-415-48598-2. The image of Shiva as Nataraj is indelibly stitched into the Indian imagination. How many various dances of Shiva are known to His worshippers. I cannot say. No doubt the root idea behind all of these dances is more or less one and the same, the manifestation of primal rhythmic energy. Whatever the origins of Shiva's dance, it became in time the clearest image of the activity of God which any art or religion can boast of. 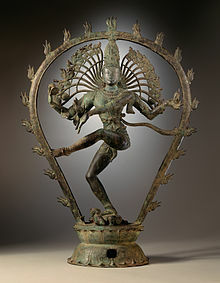 By Ananda Coomaraswamy in Nataraja. SSCNET, UCLA. Retrieved on 11 January 2014. O my Lord, Thy hand holding the sacred drum has made and ordered the heavens and earth and other worlds and innumerable souls. Thy lifted hand protects both the conscious and unconscious order of thy creation. All these worlds are transformed by Thy hand bearing fire. Thy sacred foot, planted on the ground, gives an abode to the tired soul struggling in the toils of causality. It is Thy lifted foot that grants eternal bliss to those that approach Thee. These Five-Actions are indeed Thy Handiwork." By Ananda Coomaraswamy in "Nataraja". There is no need to shy away from any form of art. Many men are interested in Bharata Natyam, however, they fear of thinking how society will look at them? How will they make a profession out of it? We have to break these barriers. There is a need to change and this cannot be changed overnight. By Aniruddha Knight in "There is no need to shy away from any art form: Aniruddha Knight". Times of India. 26 October 2013. Janet O'Shea (21 May 2007). At Home in the World: Bharata Natyam on the Global Stage. Wesleyan University Press. ISBN 978-0-8195-6837-3. Alexandra Carter; Janet O'Shea (2010). The Routledge Dance Studies Reader. Taylor & Francis. pp. 185–. ISBN 978-0-415-48598-2. Helene Scheff; Marty Sprague; Susan McGreevy-Nichols (2010). Exploring Dance Forms and Styles: A Guide to Concert, World, Social, and Historical Dance. Human Kinetics. pp. 163–. ISBN 978-0-7360-8023-1.